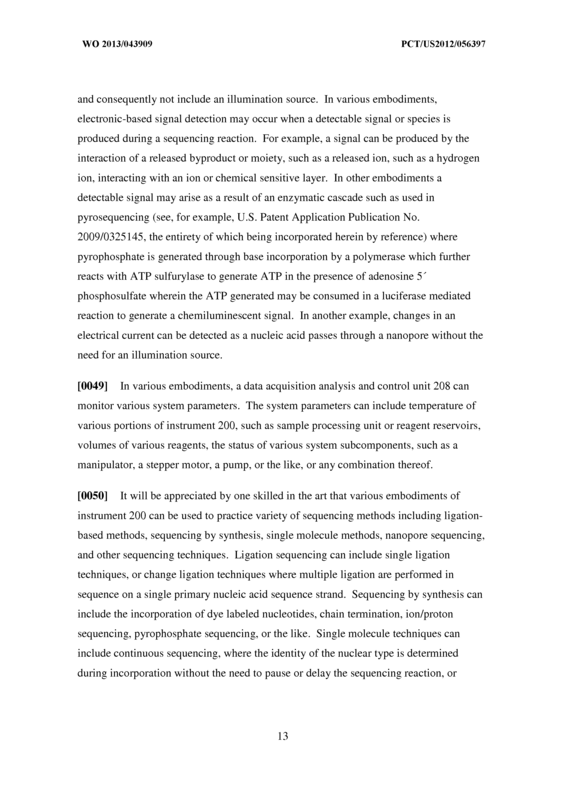 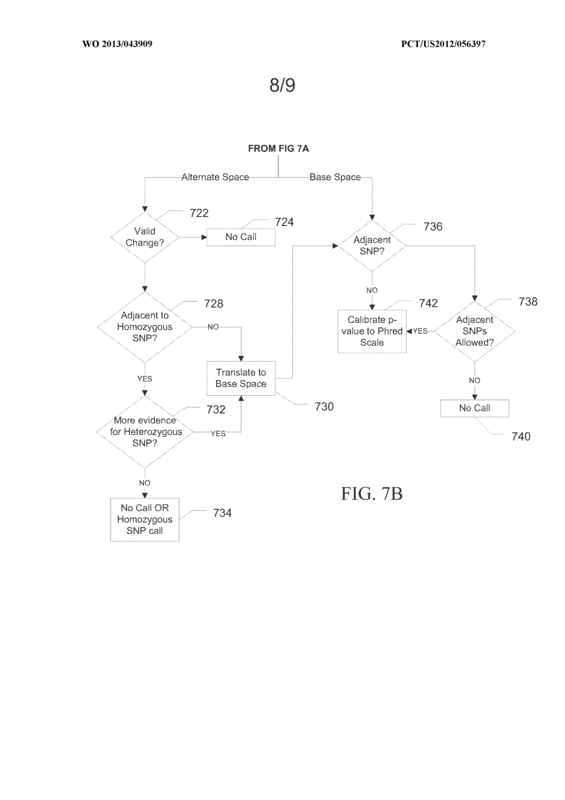 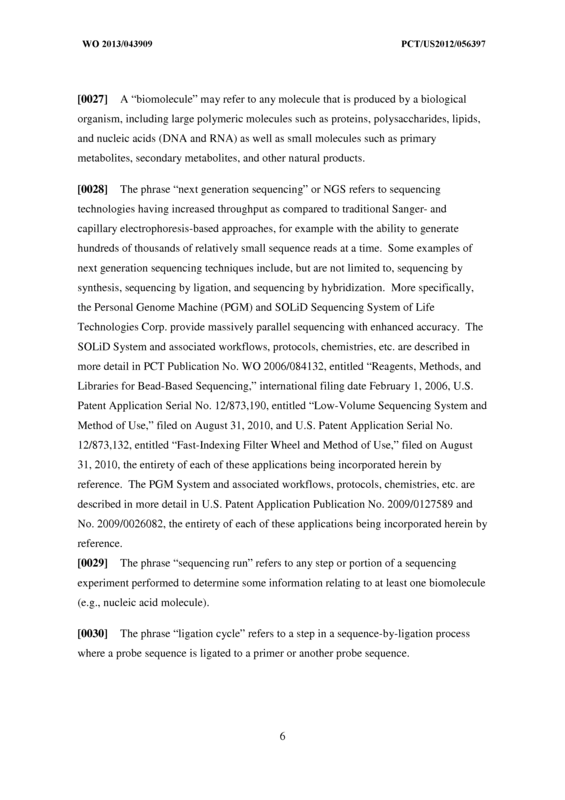 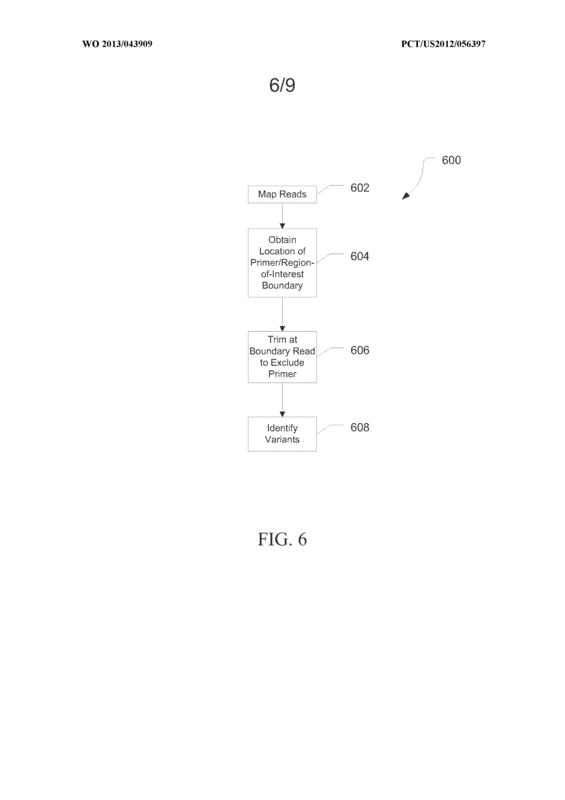 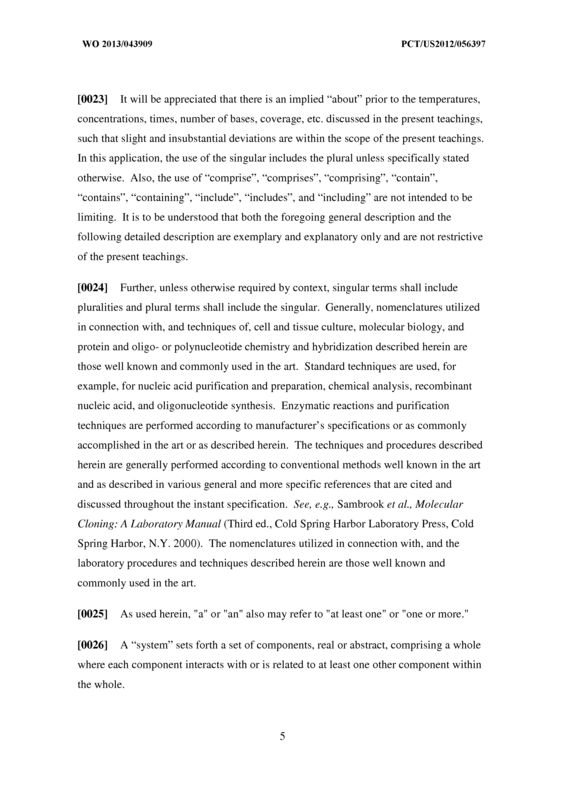 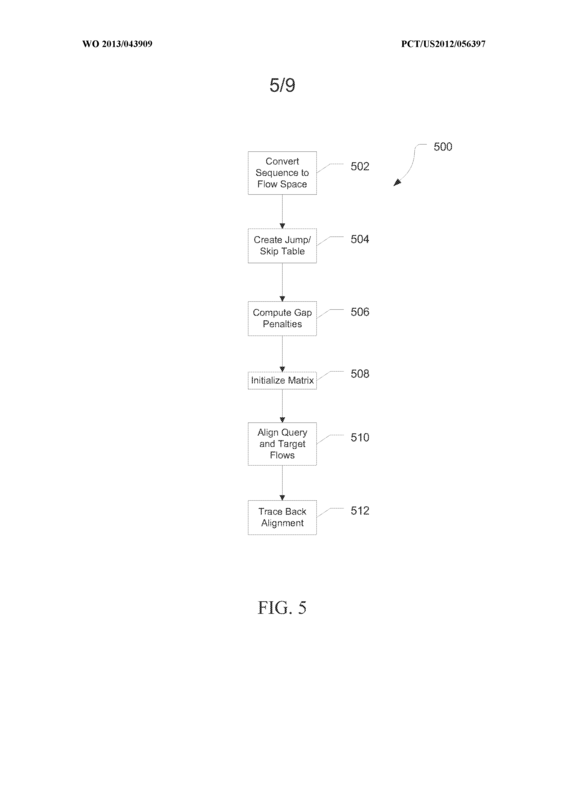 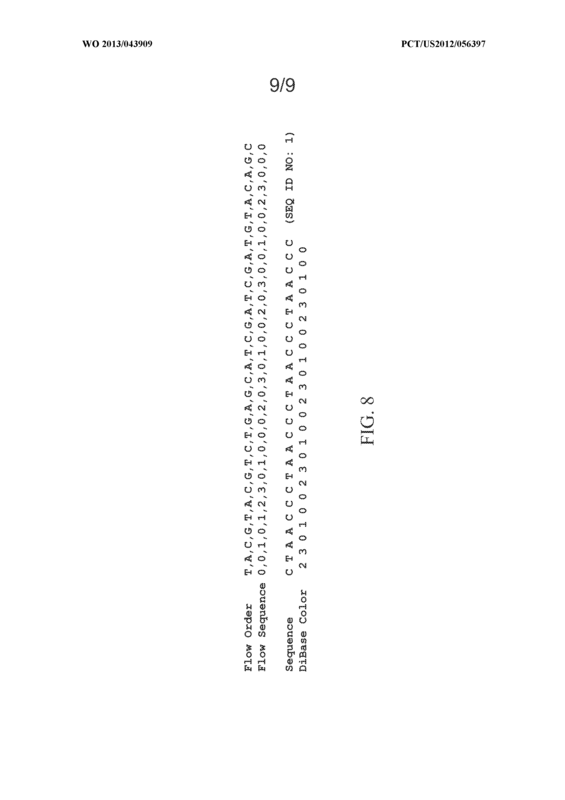 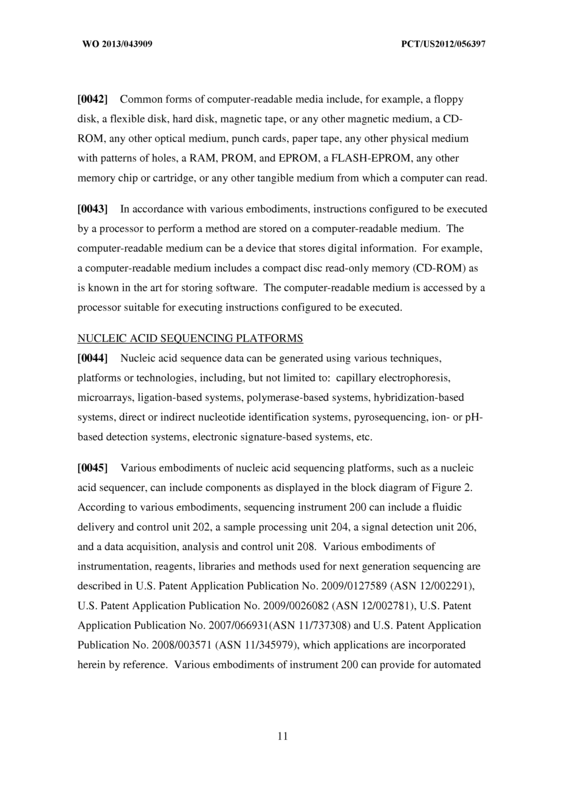 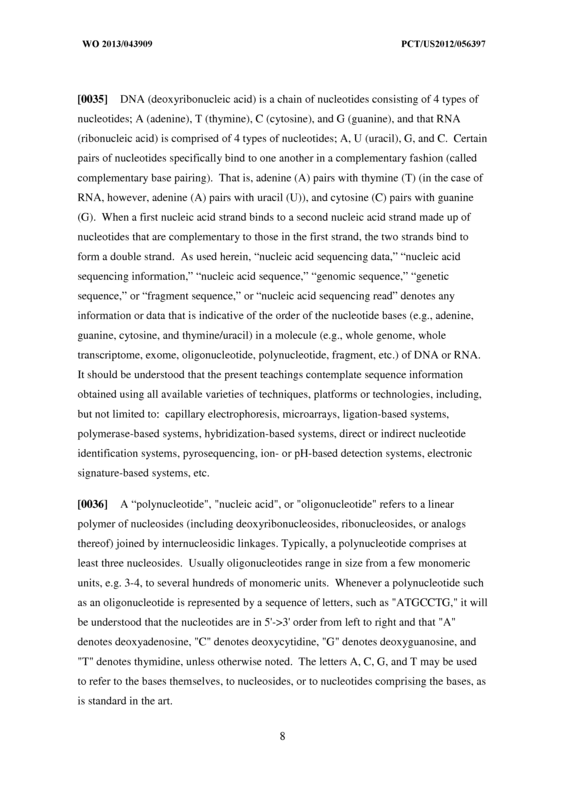 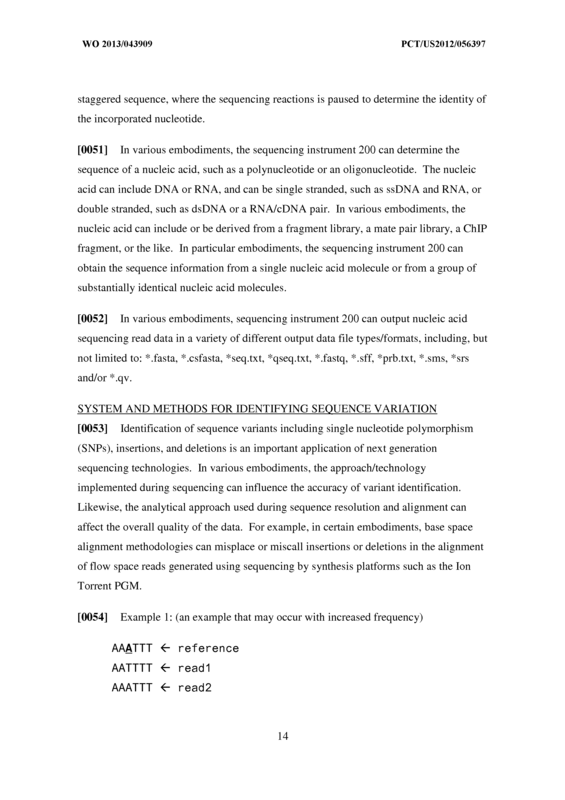 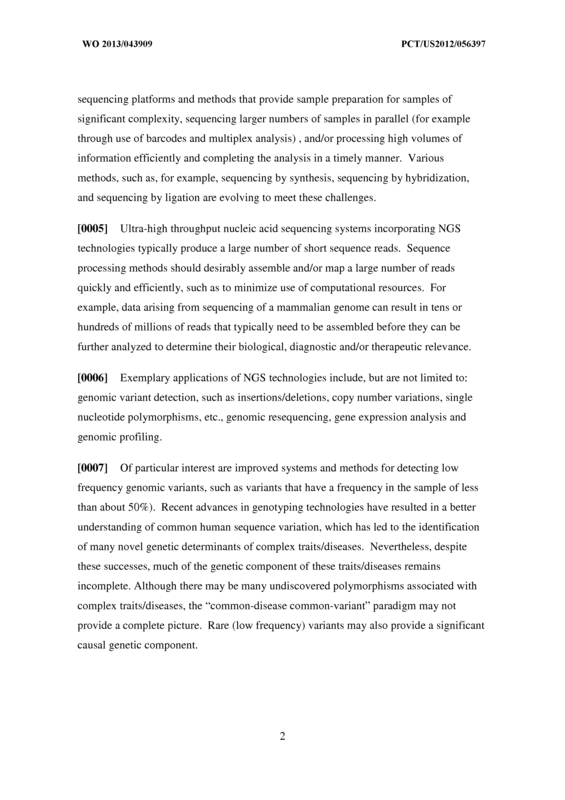 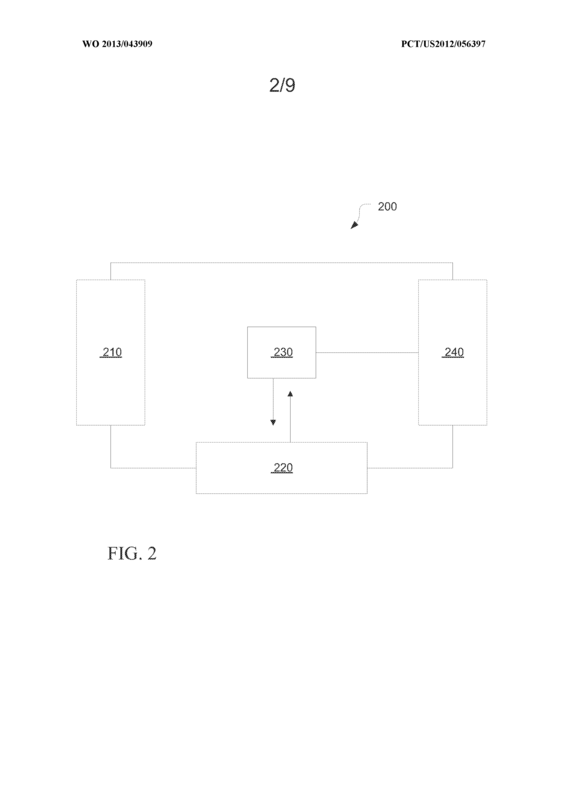 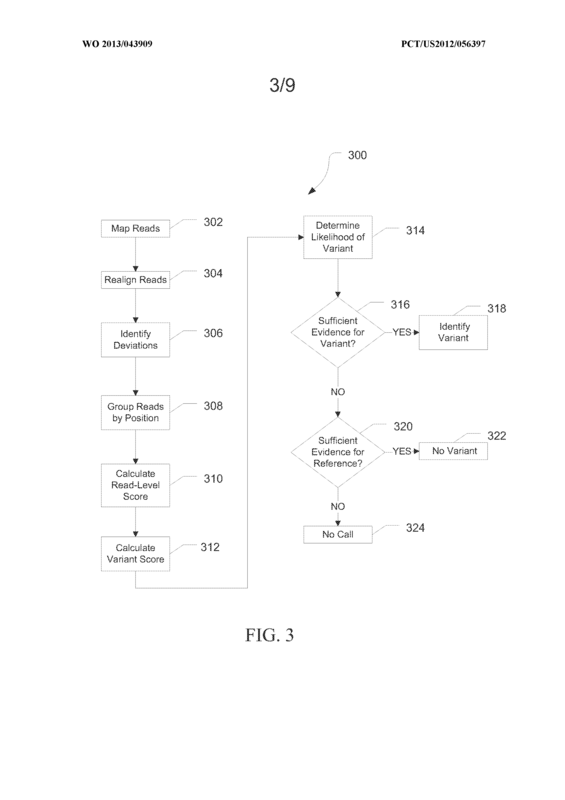 Abstract Systems and method for determining variants can receive mapped reads, and call variants. 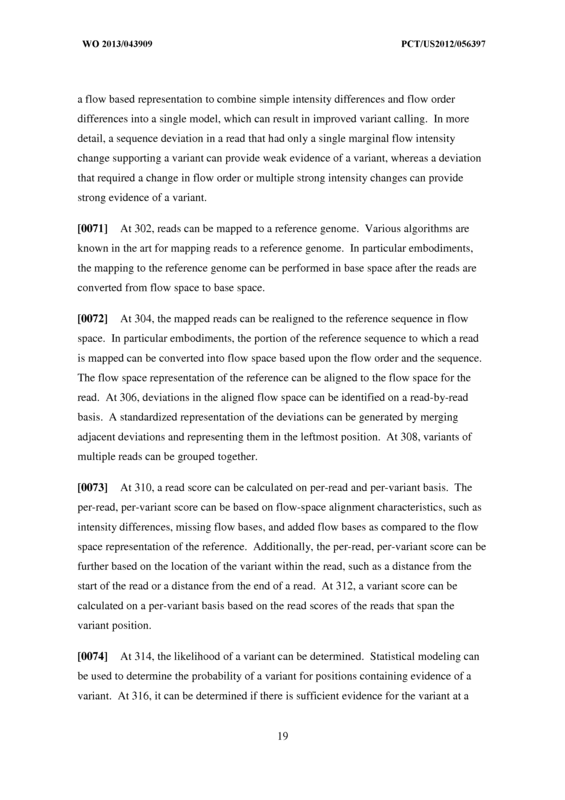 In embodiments, flow space information for the reads can be aligned to a flow space representation of a corresponding portion of the reference. 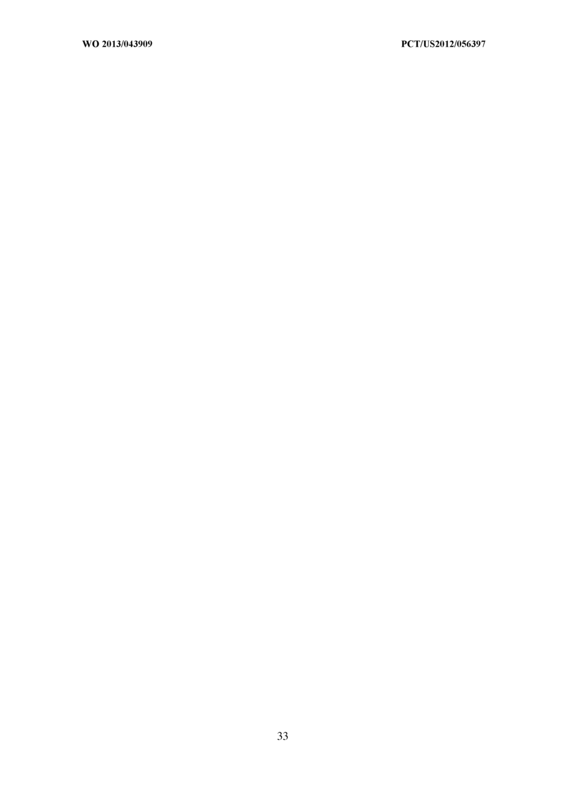 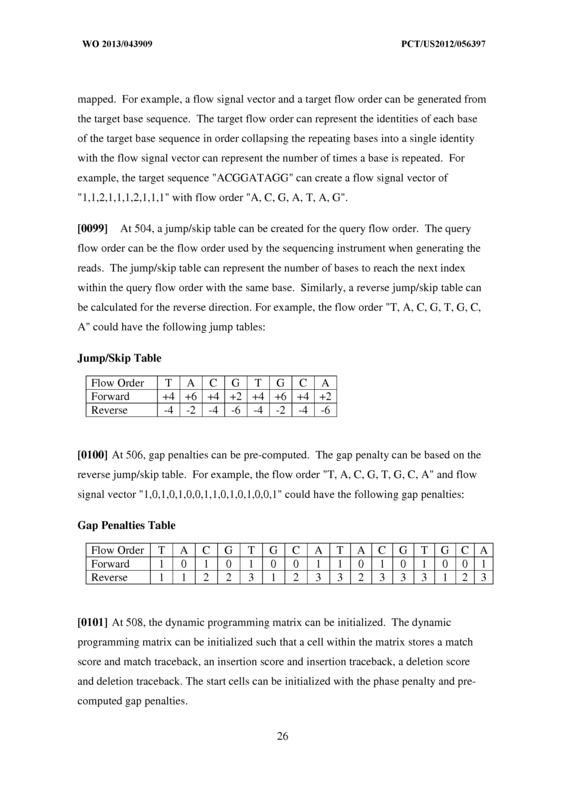 Reads spanning a position with a potential variant can be grouped and a score can be calculated for the variant. 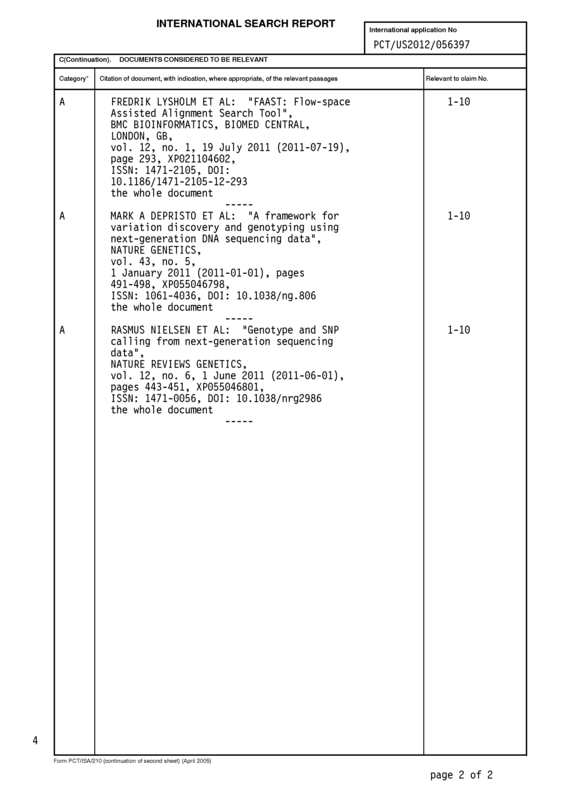 Based on the scores, a list of probable variants can be provided. 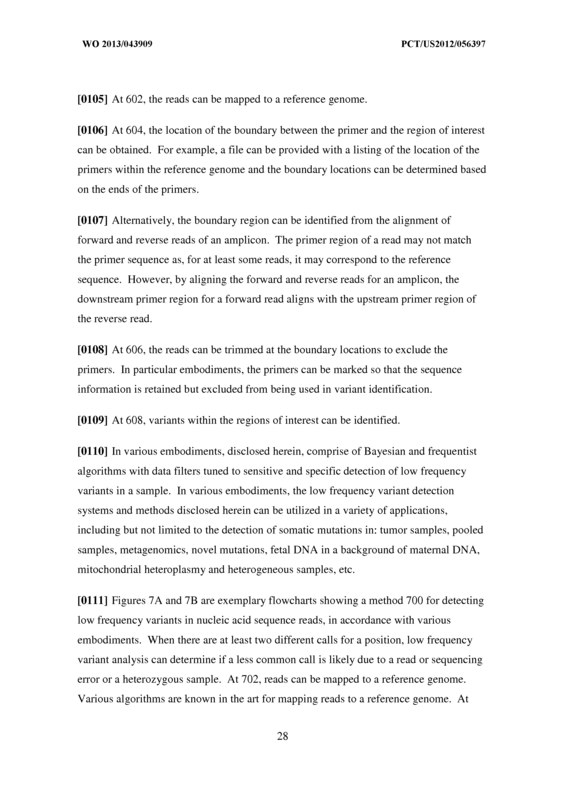 In various embodiments, low frequency variants can be identified where multiple potential variants are present at a position. 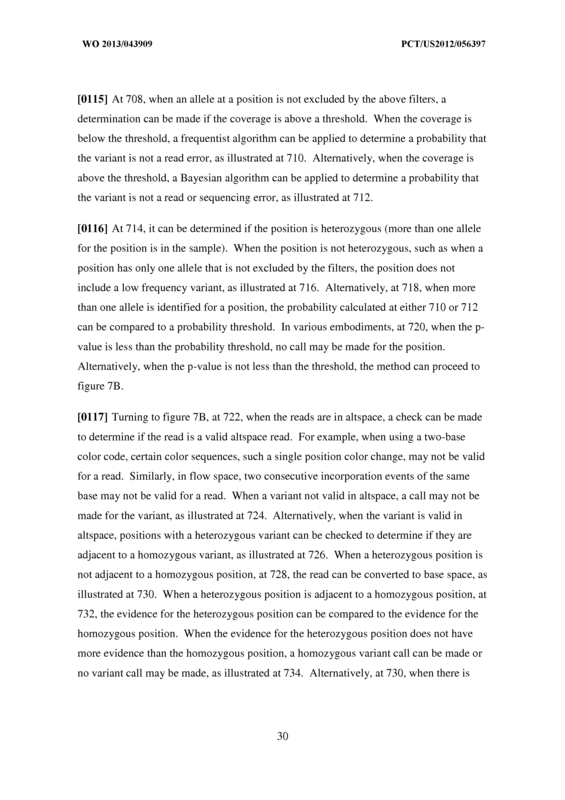 calculate a position-level score for the deviations at a position, and generate a list of probable variants based on the position-level score. 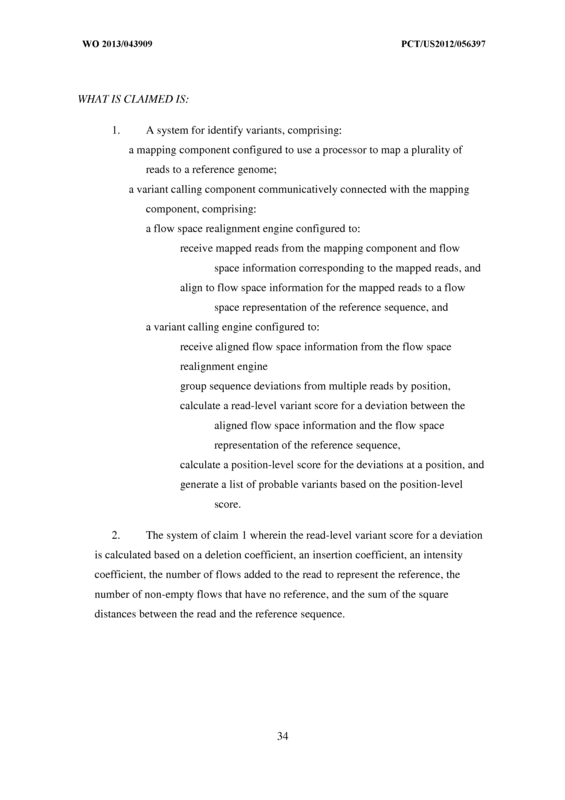 The system of claim 1 wherein the read-level variant score for a deviation is calculated based on a deletion coefficient, an insertion coefficient, an intensity coefficient, the number of flows added to the read to represent the reference, the number of non-empty flows that have no reference, and the sum of the square distances between the read and the reference sequence. 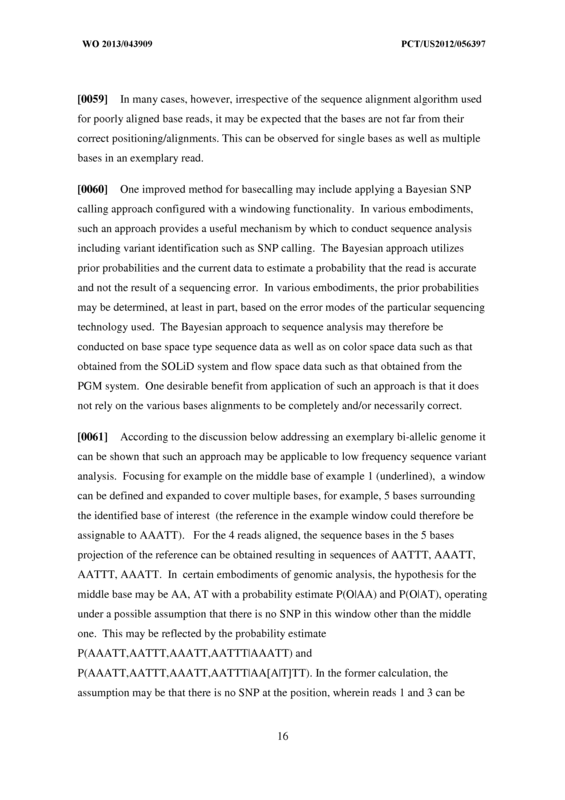 The system of claim 1 wherein calculating the position-level score includes calculating a Bayesian posterior probability at the read level using the reference context and the neighboring flow signals for the read, and calculating an average of the log likelihood of the deviation across the reads to determine a base quality value for the deviation. 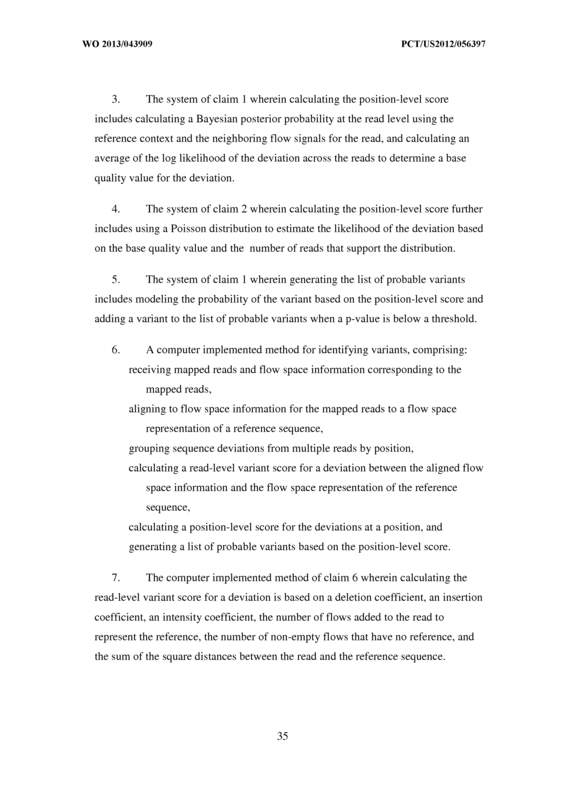 The system of claim 2 wherein calculating the position-level score further includes using a Poisson distribution to estimate the likelihood of the deviation based on the base quality value and the number of reads that support the distribution. 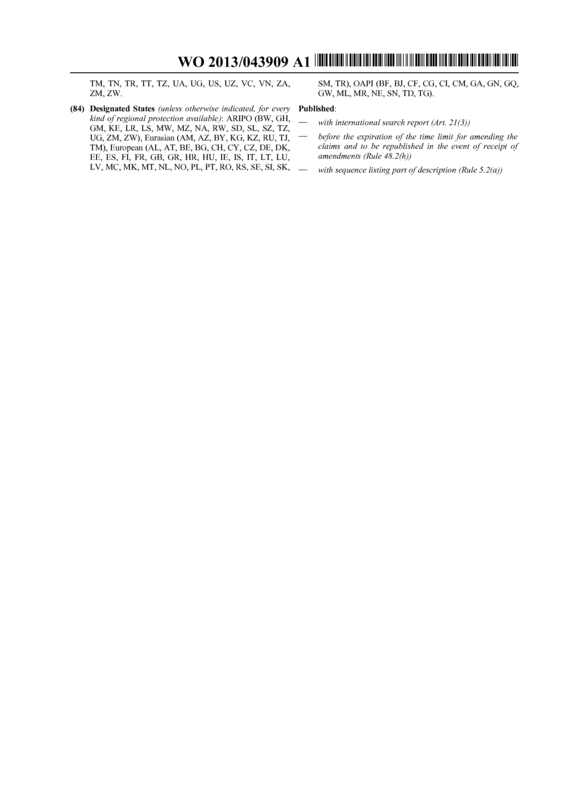 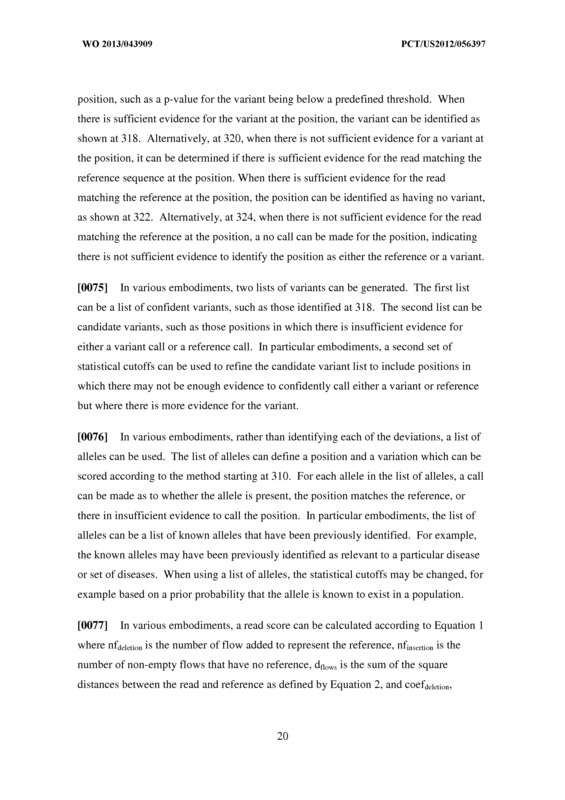 The system of claim 1 wherein generating the list of probable variants includes modeling the probability of the variant based on the position-level score and adding a variant to the list of probable variants when a p-value is below a threshold. 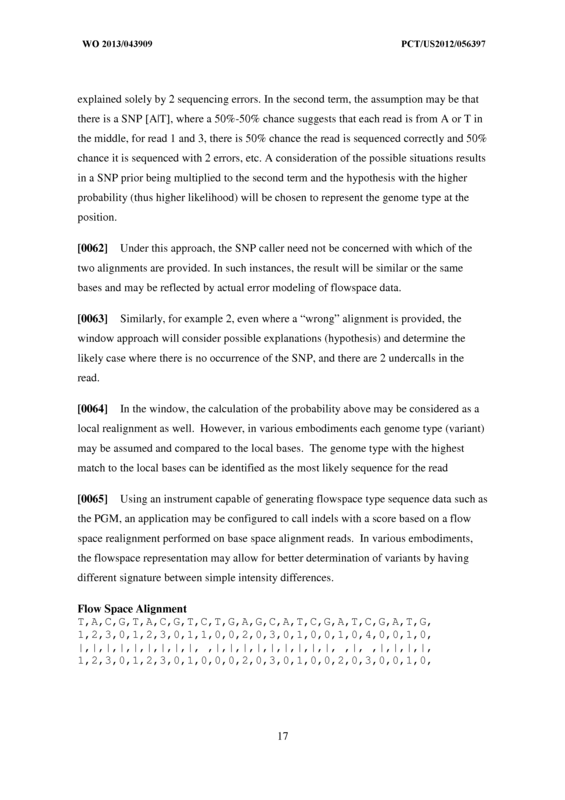 calculating a position-level score for the deviations at a position, and generating a list of probable variants based on the position-level score. 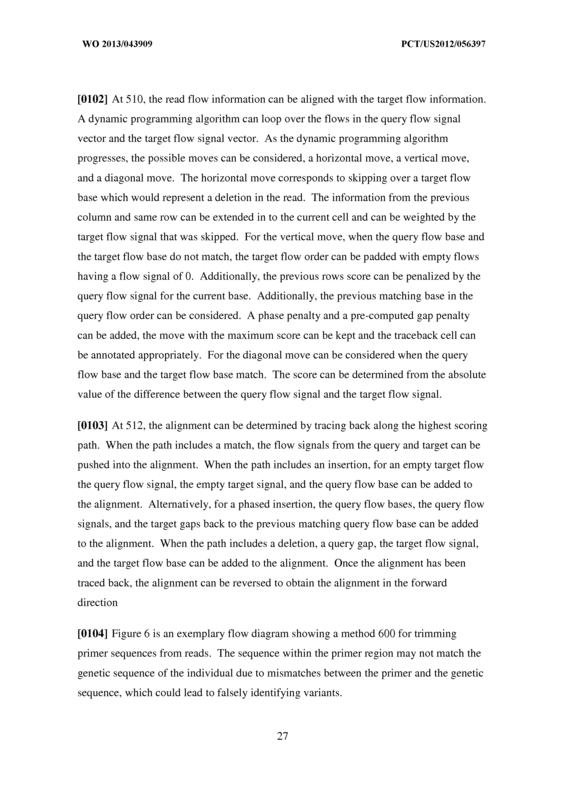 The computer implemented method of claim 6 wherein calculating the read-level variant score for a deviation is based on a deletion coefficient, an insertion coefficient, an intensity coefficient, the number of flows added to the read to represent the reference, the number of non-empty flows that have no reference, and the sum of the square distances between the read and the reference sequence. 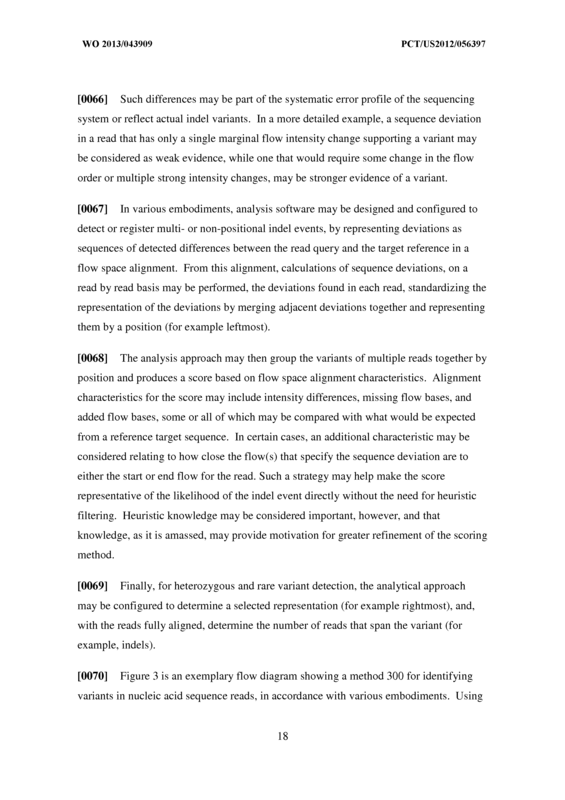 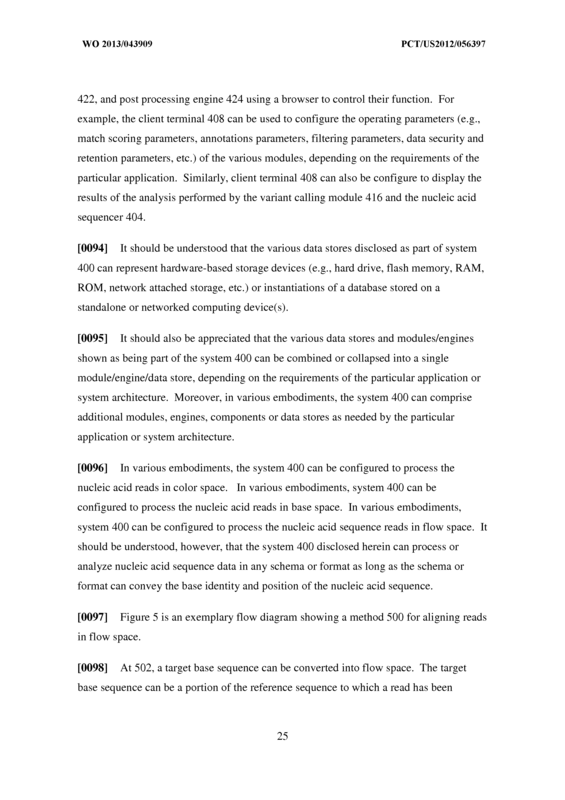 The computer implemented method of claim 6 wherein calculating the position-level score includes calculating a Bayesian posterior probability at the read level using the reference context and the neighboring flow signals for the read, and calculating an average of the log likelihood of the deviation across the reads to determine a base quality value for the deviation. 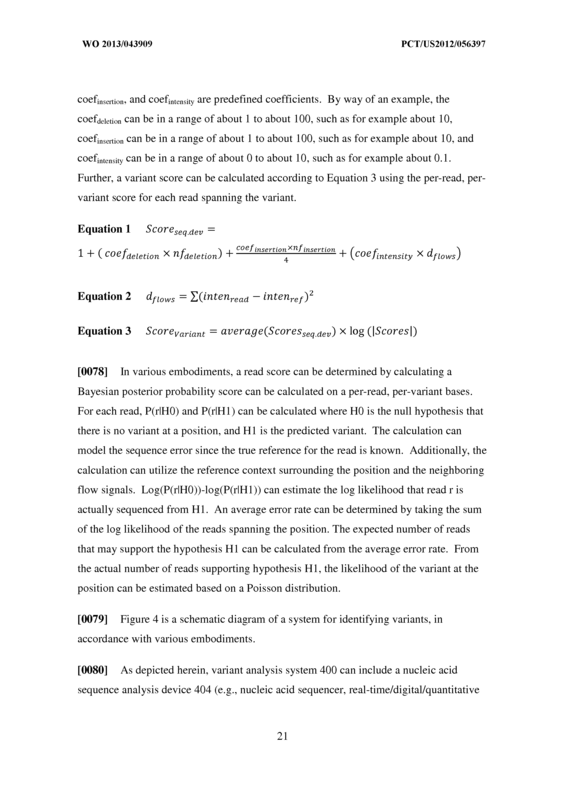 The computer implemented method of claim 2 wherein calculating the position-level score further includes using a Poisson distribution to estimate the likelihood of the deviation based on the base quality value and the number of reads that support the distribution. 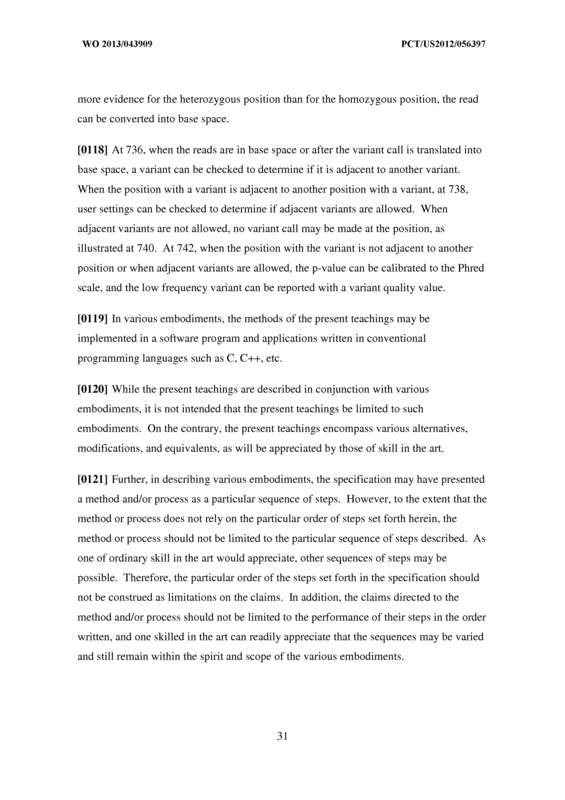 The computer implemented method of claim 1 wherein generating the list of probable variants includes modeling the probability of the variant based on the position-level score and adding a variant to the list of probable variants when a p- value is below a threshold. 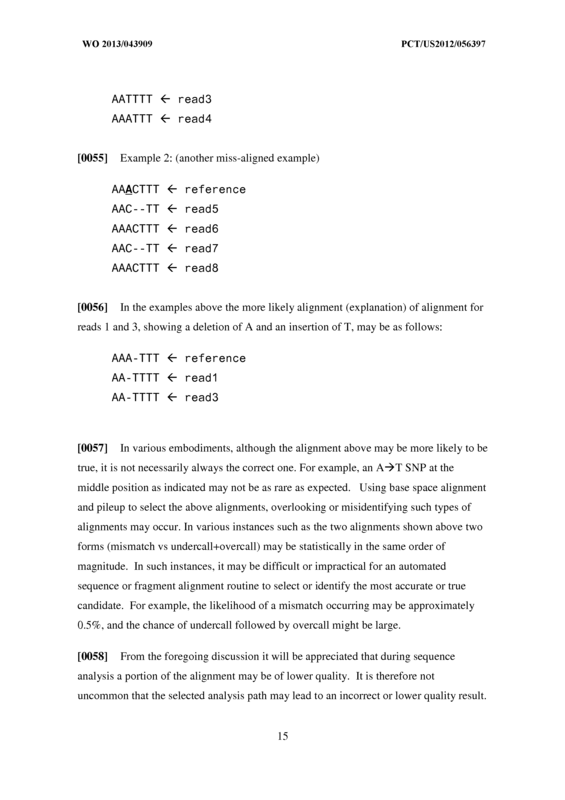 provide a list of heterozygous positions based on the likelihood for each of the alternate alleles. 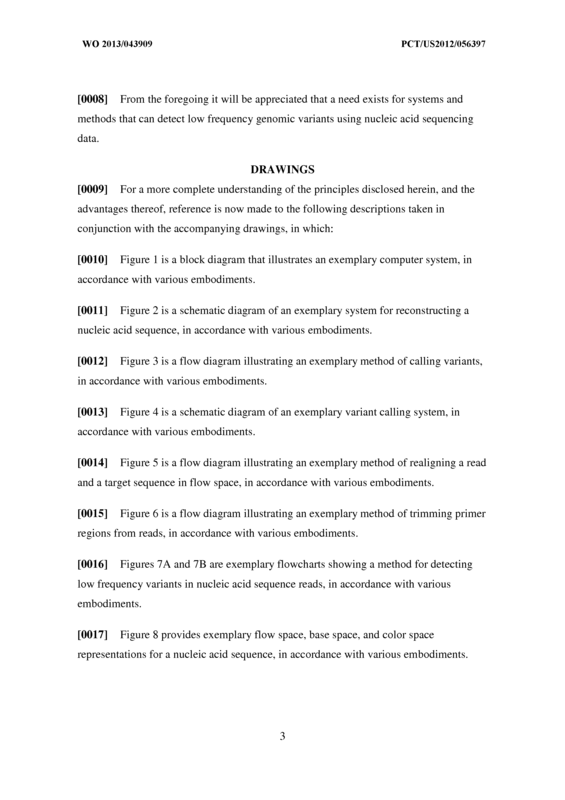 The system, as recited in claim 11, wherein the reads are in base space. 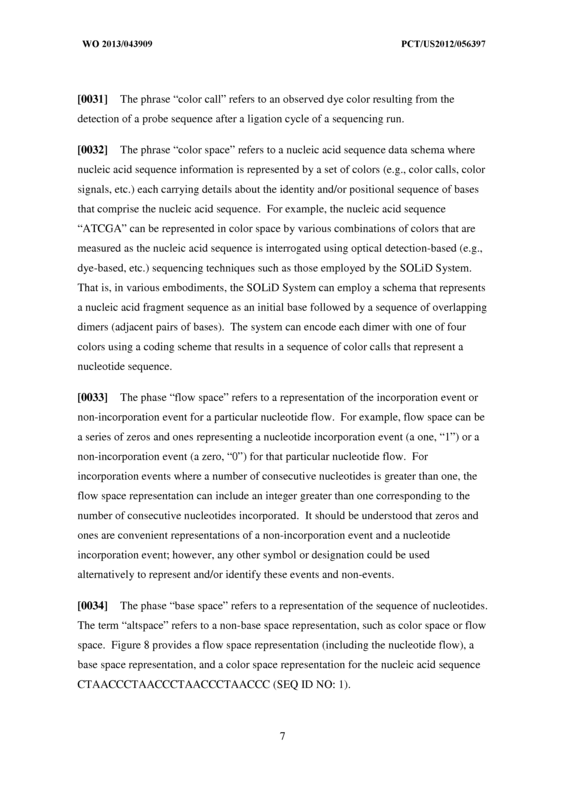 The system, as recited in claim 11, wherein the reads are in color space or flow space. 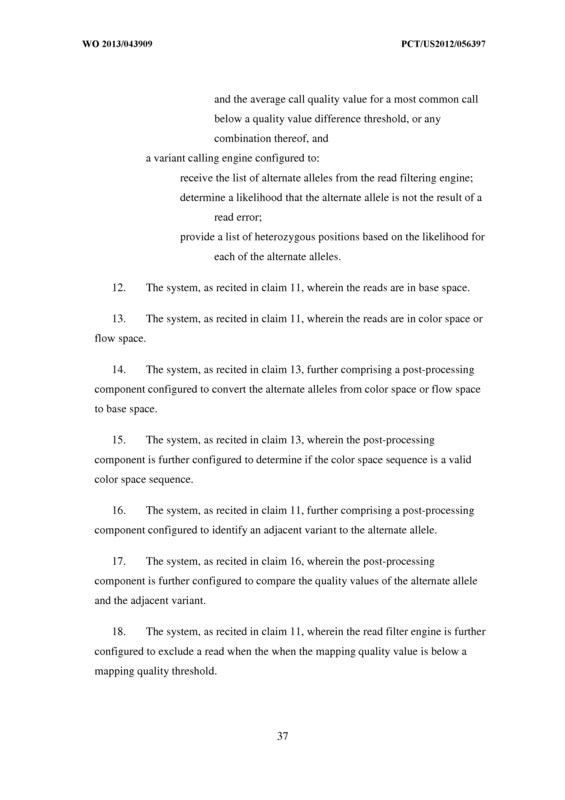 The system, as recited in claim 13, further comprising a post-processing component configured to convert the alternate alleles from color space or flow space to base space. 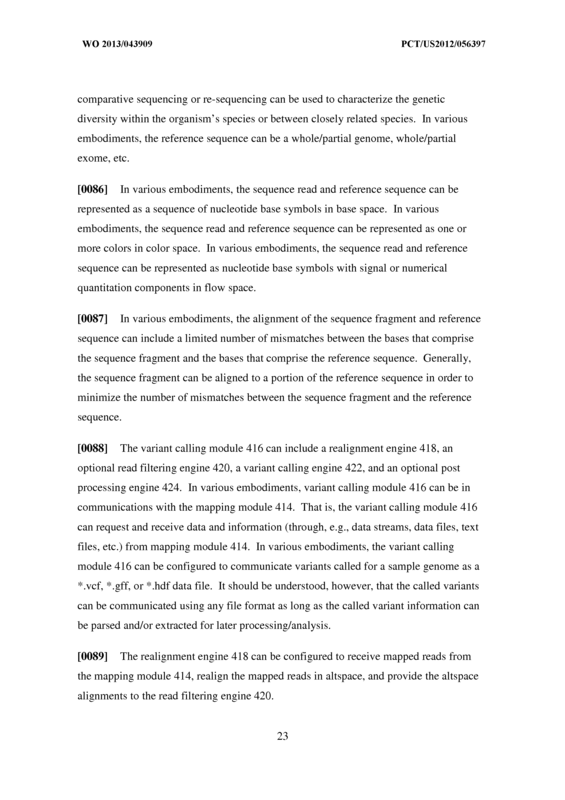 The system, as recited in claim 13, wherein the post-processing component is further configured to determine if the color space sequence is a valid color space sequence. 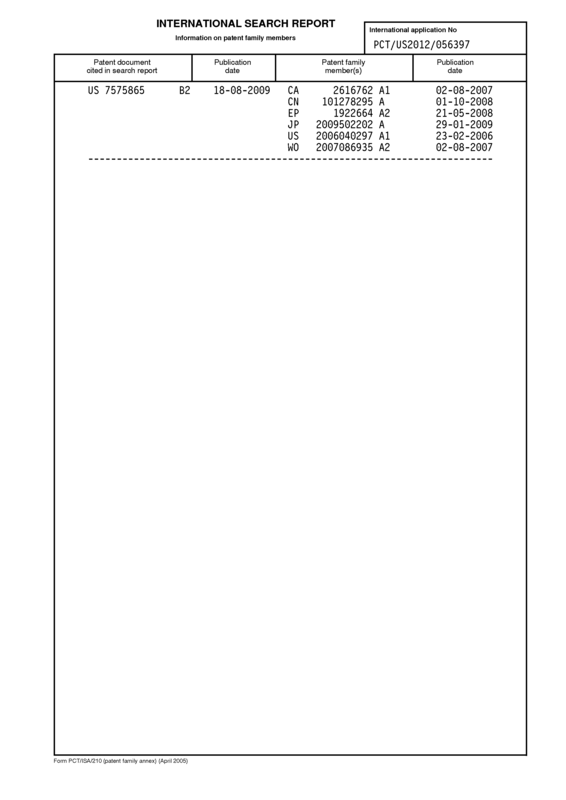 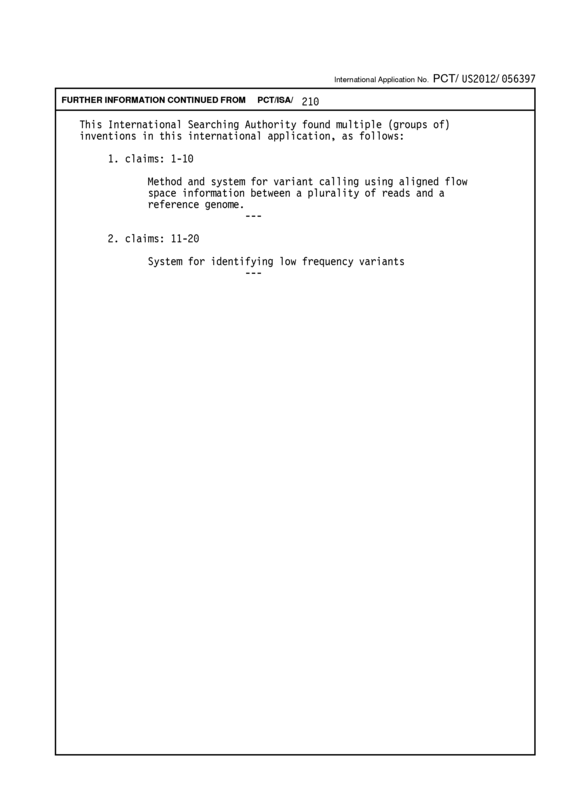 The system, as recited in claim 11, further comprising a post-processing component configured to identify an adjacent variant to the alternate allele. 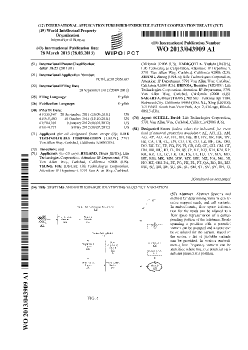 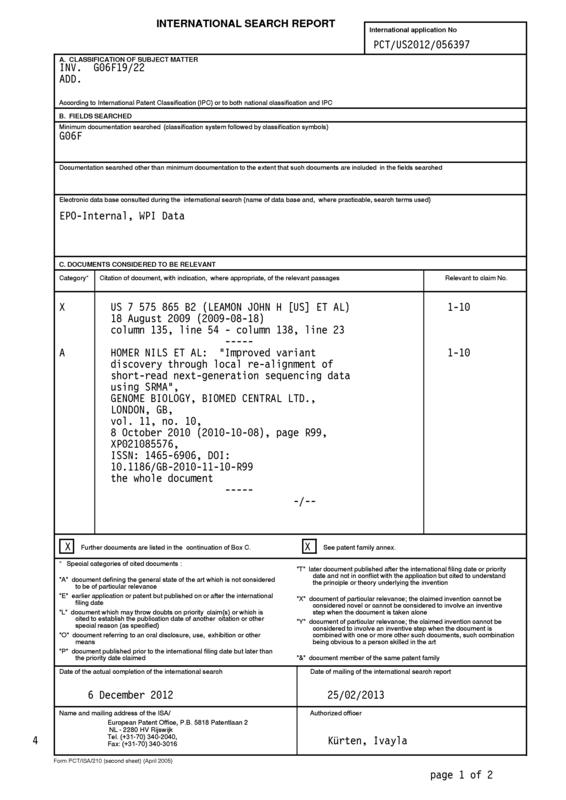 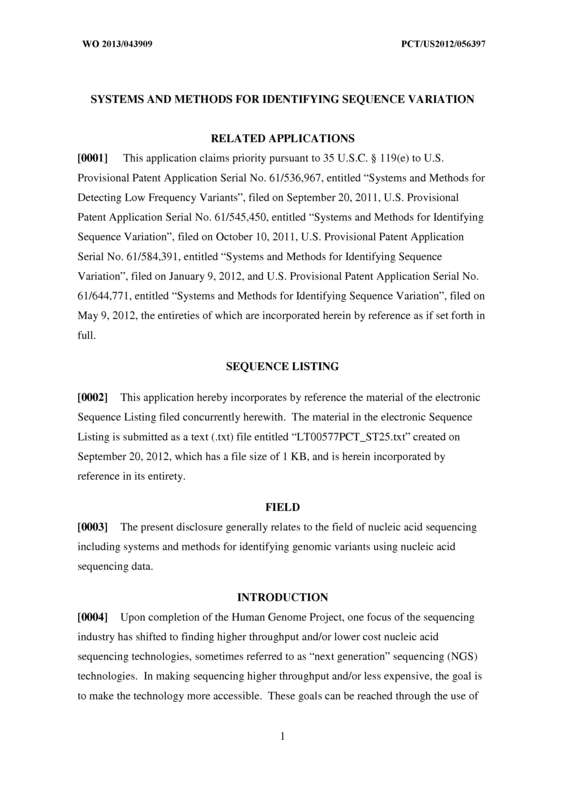 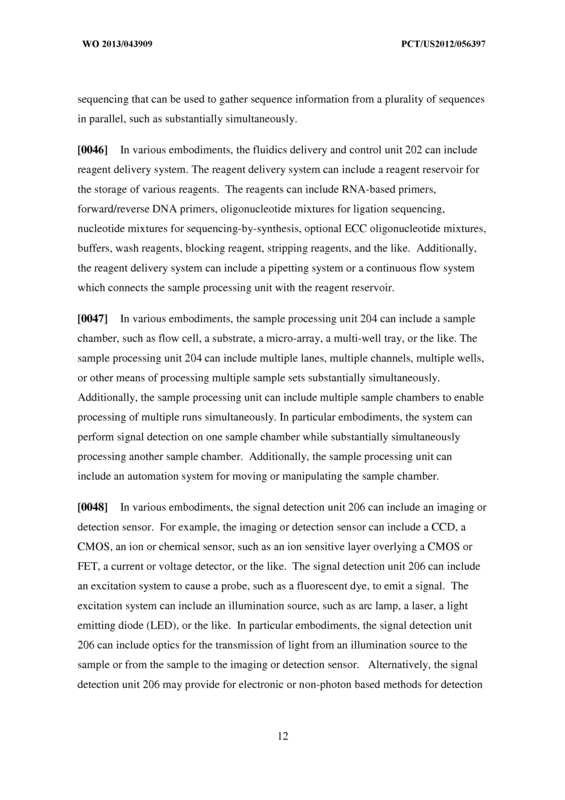 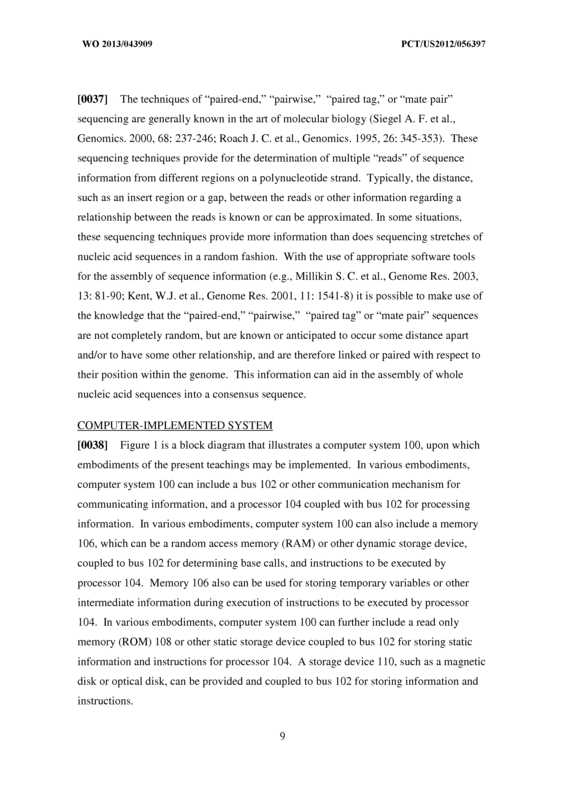 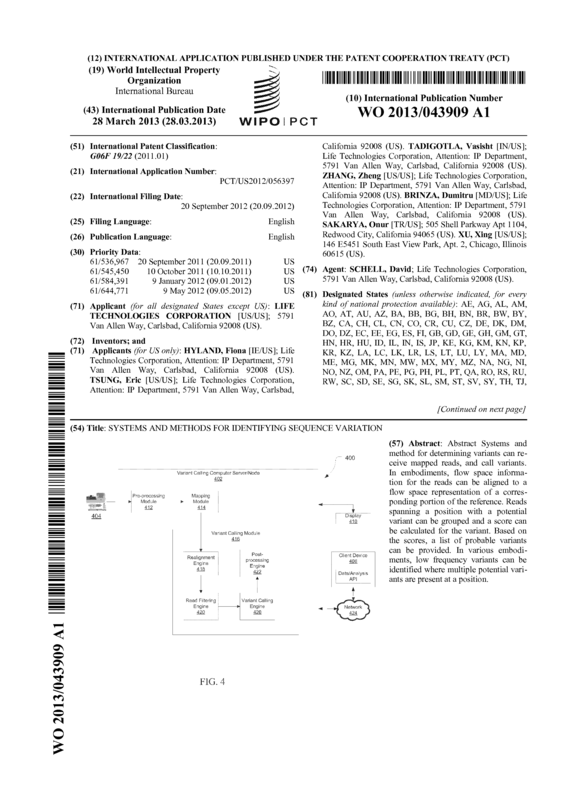 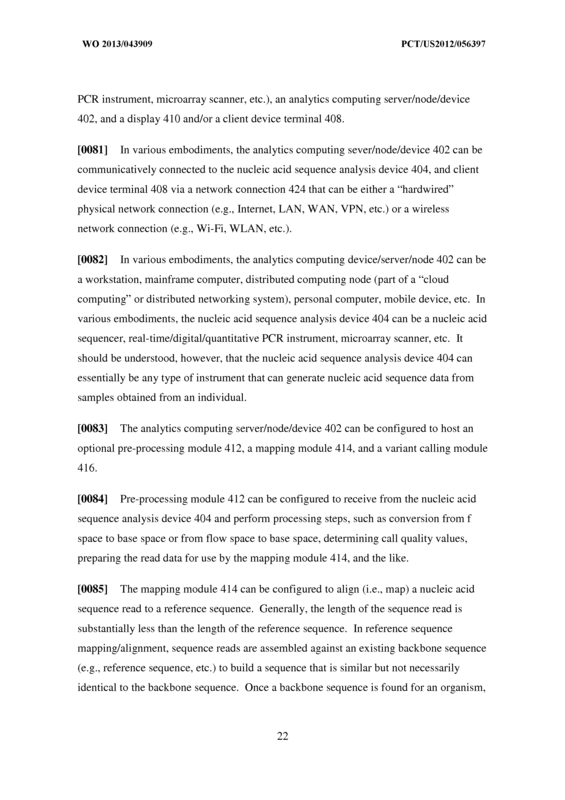 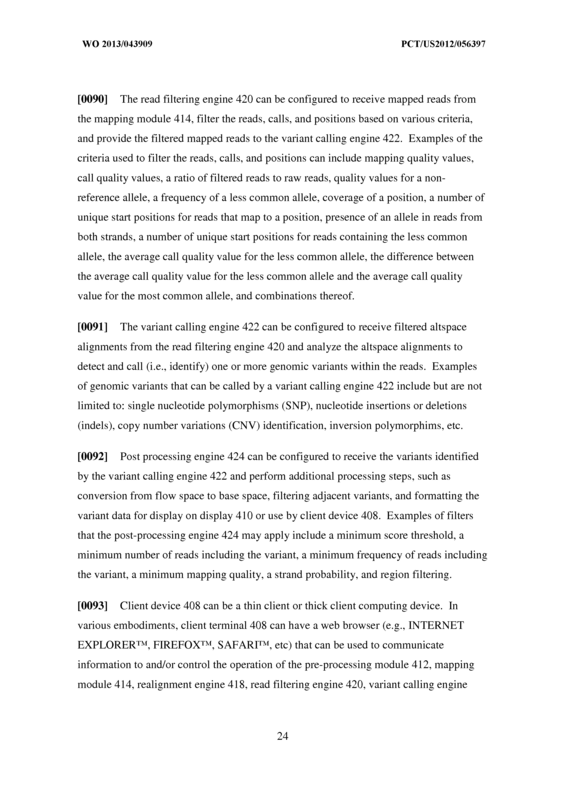 The system, as recited in claim 16, wherein the post-processing component is further configured to compare the quality values of the alternate allele and the adjacent variant. 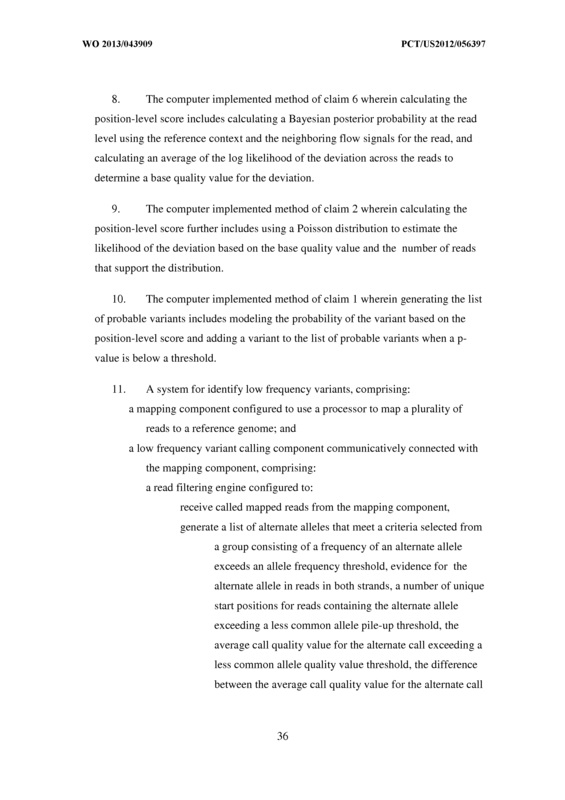 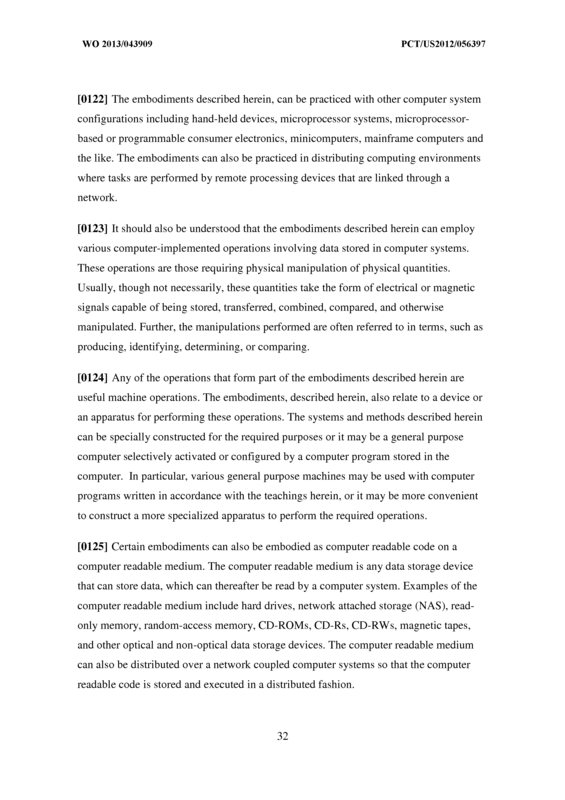 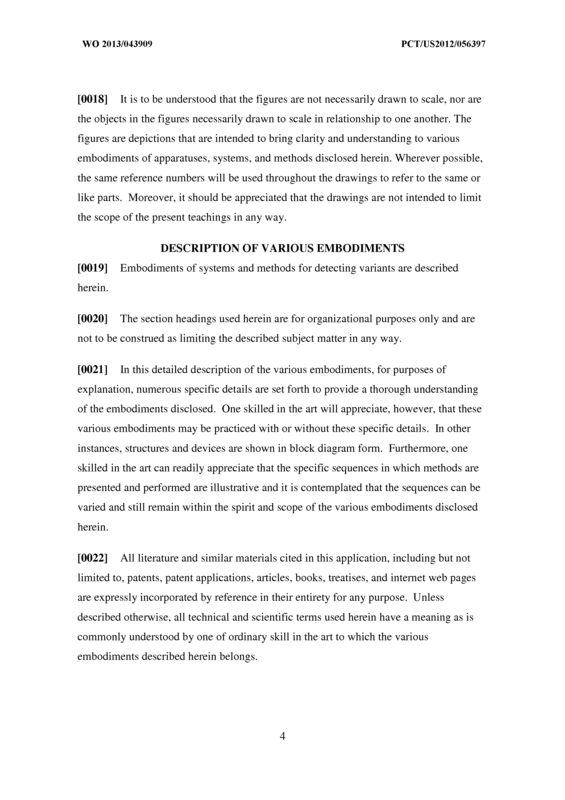 The system, as recited in claim 11, wherein the read filter engine is further configured to exclude a read when the when the mapping quality value is below a mapping quality threshold. 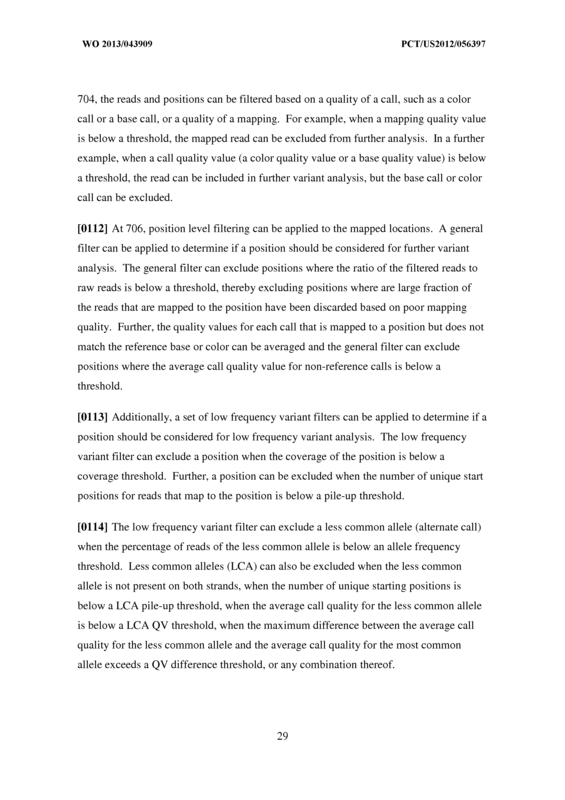 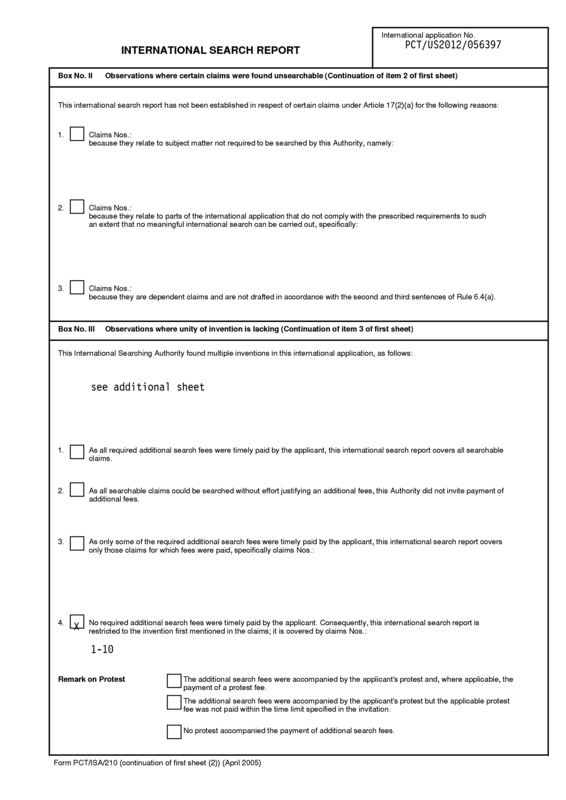 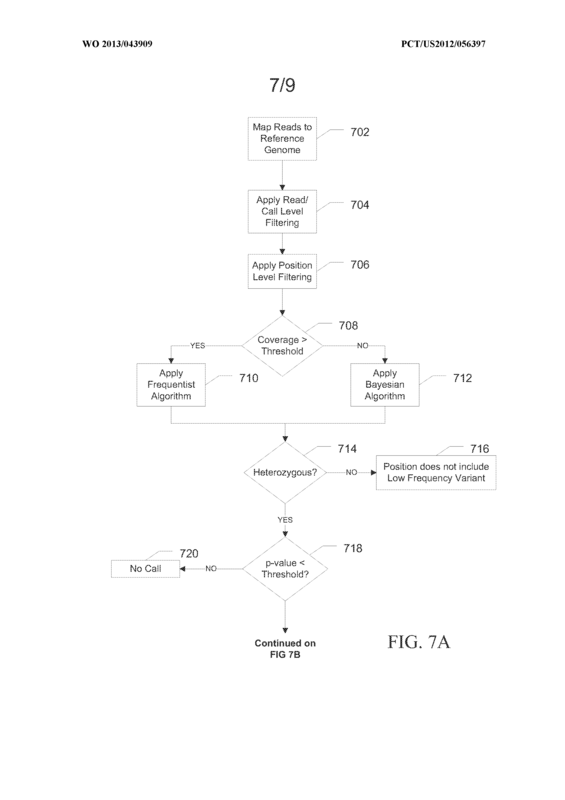 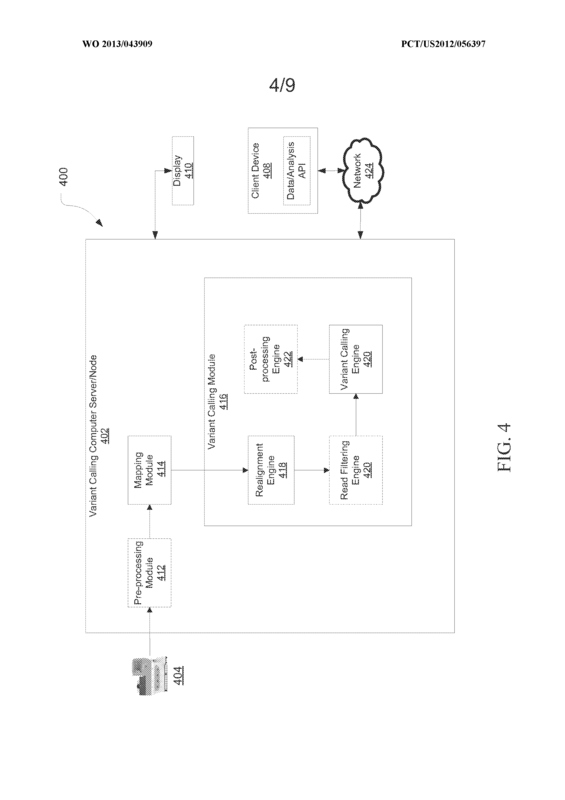 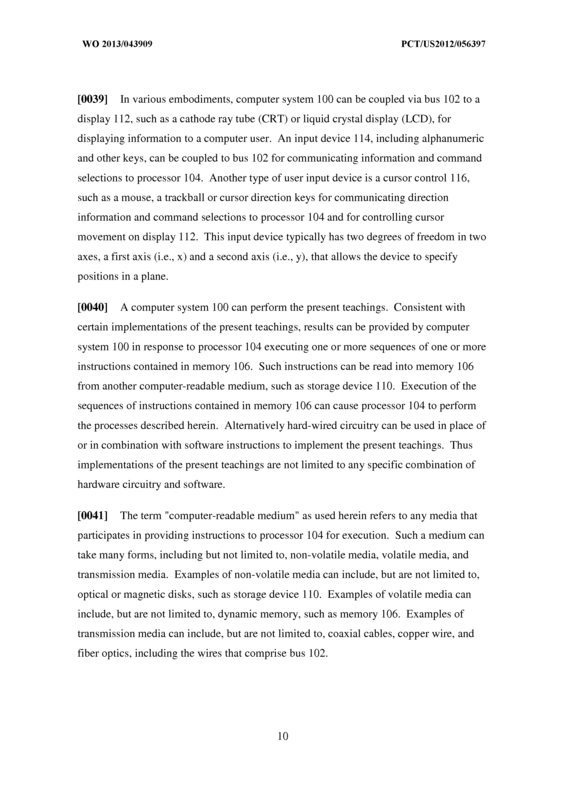 The system, as recited in claim 11, wherein the read filter engine is further configured to exclude a call when the call quality value is below a call quality value threshold. 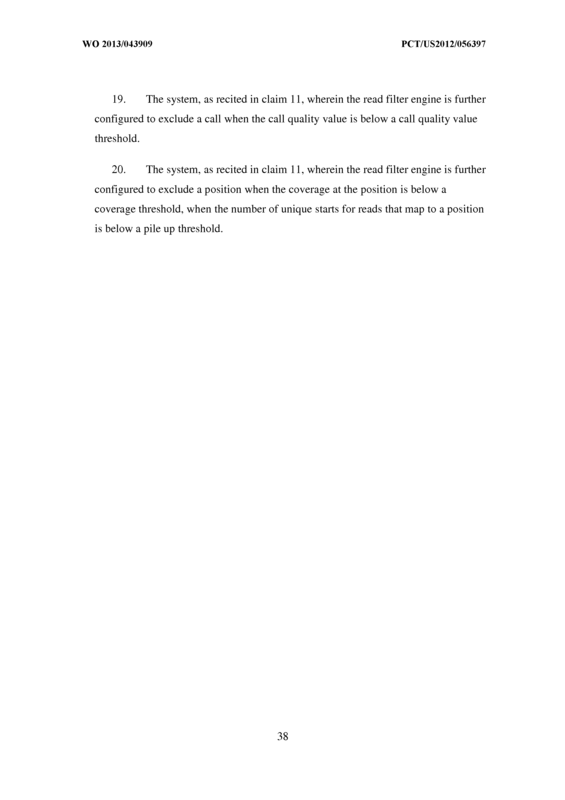 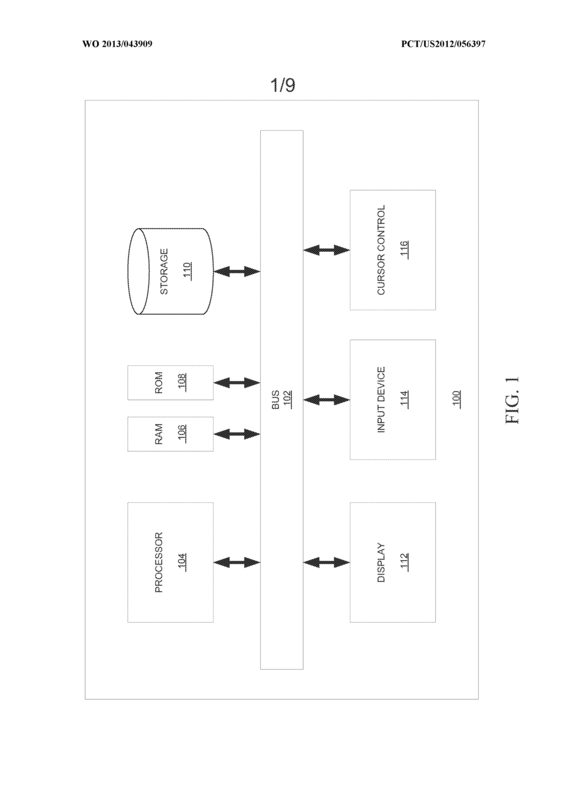 The system, as recited in claim 11, wherein the read filter engine is further configured to exclude a position when the coverage at the position is below a coverage threshold, when the number of unique starts for reads that map to a position is below a pile up threshold.